Strategize ways to avoid adverse immigration consequences in criminal cases. 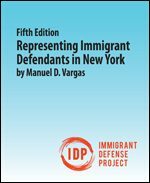 Representing Immigrant Defendants in New York, 5th Edition, is currently out of stock. Please contact us via the form below, and we’ll let you know when updated resources are available.